July 2018, Taipei – Advantech, a global leader in the embedded computing market, is pleased to announce its first Arm-based 4K solution, comprising the RSB-4680 3.5” SBC and EPC-R4680 box computer, powered by the Rockchip Arm® Cortex®-A17 RK3288 Quad Core high-performance processor. The RSB-4680 and EPC-R4680 support 4K resolution via HDMI 2.0, with additional support for multiple displays with extension mode. The solution also offers dual touch operation capability. Multiple I/O ports and wireless connectivity options make it ideal for digital signage, self-service, kiosks, and POS applications. The RSB-4680 and EPC-R4680 adopt Rockchip’s RK3288 SoC, which integrates four Arm Cortex-A17 processor cores, and the Arm Mali-T764 graphics engine, which supports OpenGL ES1.1/2.0/3.0,OpenCL 1.1 and DirectX 11. 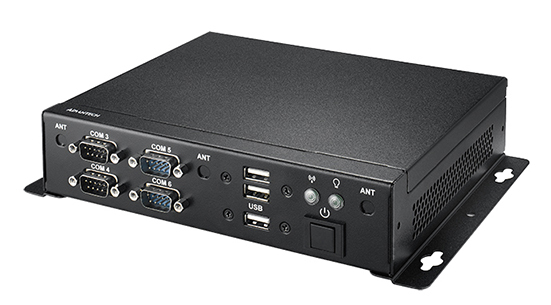 The solution is the first Arm-based SBC and BOX PC to support the H.265 HW decoder, delivering 4K @ 60 FPS via HDMI 2.0 at a resolution of 3840 x 2160 @ 60 Hz for stunning graphics and an excellent user experience. The solution also supports dual-channel 18/24/30-bit LVDS and VGA for multi-display capability, with two independent display outputs for a combination of HDMI+VGA, HDMI+LVDS, or VGA+LVDS. The RSB-4680 and EPC-R4680 offer multiple I/O options, including 5 x USB 2.0, 1 x OTG, 6 x COM, 8 x GPIOs, and 1 x Gigabit Ethernet ports. They also support wireless connectivity, including 1 x M.2 E-key slot for Wi-Fi/BT modules and 1 x mini PCIe for 3G/4G modules. Collectively, these features make the RSB-4680 and EPC-R4680 suitable for all kinds of applications, especially for kiosks, POS, and vending machines, which need to connect to many devices (e.g., printers, scanner, card readers). For software support, the RSB-4680 and EPC-R4680 provide different layers of software services to assist customers during the application design phase. 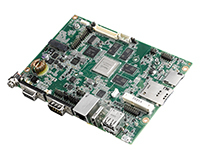 The RSB-4680 and EPC-R4680 support Android 6.0 and come bundled with an evaluative Android image, and provide a complete board support package (BSP) to help users develop their own applications. The BSP comes with source code examples and tools for testing and evaluation and for setting up dual independent displays and touch operation. The solution is also bundled with Advantech’s WISE-PaaS/RMM software suite, which offers remote management and security features. This smart software boosts the performance and value of IoT applications from the edge to the cloud. Advantech’s bundle of hardware/software features and customized services make the RSB-4680 3.5” SBC and EPC-R4680 box computer the ideal choice for developing new industrial IoT applications.